How stupid are those strips? Hey, Globeniks: Are you having funnies yet? Yeah – neither are we. This entry was posted in Uncategorized and tagged Ask Shagg, Boston Sunday Globe, Seattle Post-Intelligencer, WuMo, Zippy the Pinhead. Bookmark the permalink. Thanks for writing. 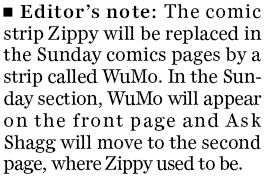 Zippy will remain in our daily comics pages, just not Sunday. But it has been around for a long time, and like all our cartoon strips we are constantly evaluating new ones that come along that we think will keep those pages fresh. We think WuMo is a good example of that and over time readers will come to appreciate its humor. We, of course, know that all comic strips are subjective, and what one reader thinks is hilarious, another may not find funny at all. Every time we change a strip, we hear from some readers who are thrilled at the change and others who don’t understand it. But as with everything we do, we always appreciate our readers’ feedback and take it seriously. I’m working on a strip “about” the whole thing today—it’ll run in a month or so. Meanwhile, people should continue to protest Zippy’s removaal from the Sunday Globe—editors do pay attention to this sort of pressure. Thanks. This’ll make a nice follow-up post. Why not run here instead? Wow, it’s really the Higher Power behind Zippy! I am so sad, I’ve just written to the Globe, pointing out that it says something about how they view the intelligence levels of their readers by dumping Zippy and keeping the beyond tiring Family Circus. Not to mention that ridiculous strip with the poorly drawn idiot dogs that isn’t remotely funny. With you on both, Kate.